Travis Smith is the author of the new book Superhero Ethics. 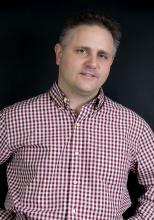 His work has appeared in publications including The Weekly Standard, and he is an associate professor of political science at Concordia University in Montreal. A: Originally, I was going to write an article for Spider-Man’s 50th anniversary—a “Discourse on the first five decades of the Amazing Spider-Man.” That expanded into an article contrasting Spider-Man with Batman, which appeared in The Weekly Standard. When asked if I could write an entire book like that—this superhero versus that superhero, asking whom we should admire and emulate—well, you know what they say: Write what you know! Since stories about superheroes occupy significant space in my brain, that decision was a no-brainer. I use a lot of pop culture references in my classroom. I teach political theory. Examples from pop songs to Disney movies to YouTube personalities to comic books are really useful for illustrating philosophical ideas and arguments—especially when you don’t want to be too on the nose about hot-button issues and controversial current events. Not that students won’t get worked up when you use Plato and Aristotle to compare Alicia Keys to Beyoncé! 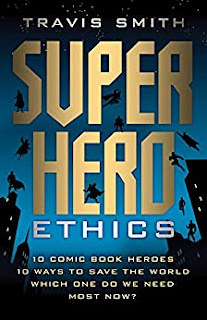 Superhero Ethics arises in part out of the kinds of examples I use to make old and difficult texts familiar and relevant to undergraduates. But superhero stories are popular across so many demographics nowadays. Whose mom doesn’t have a crush on Tony Stark? A friend just told me his son plans to be Killmonger for Halloween. Superhero stories speak to us about our hopes and fears, about who we think we are and who we wish we could be. They represent our values and aspirations. They offer criticisms of our culture, too. In writing the book, I would ask myself: Who does this superhero resemble in our society? What makes that sort of person commendable? What makes them flawed or deficient as a role model? I wanted to write a book that examined these fantastical characters in a way that showed that there’s more going on in these tales than super-speed and telekinetic feats. Superhero Ethics is for people who enjoy superhero stories and would like to consider further what they say about us, and to us, today. The book is also for people generally who think that good character is important for human happiness and social well-being and are curious or concerned about how these issues are being dealt with in the popular culture. Q: You write that "this book is premised on the idea that it's not their superpowers that make superheroes so super." What would you say does make them super, then, and how can we learn from those qualities? A: It’s precisely because their superpowers aren’t what make them super in the most important ways that it becomes possible for us to learn from them. I examine the ways they represent different human excellences, or our struggles with different parts of the human condition that we cannot avoid dealing with in our lives. And I don’t restrict myself to assessments of their courage or altruism—qualities that all superheroes tend to share. I looked for what was distinctive in each character. How do they manage anger at injustice? How do they aspire to live honorably? How powerful is our imagination? How much control over our lives can we have? Is it good to be patriotic? Sometimes superpowers are metaphors for non-super human abilities, though. Mister Fantastic’s ability to stretch his body is fitting given that what really defines him is his intellect. A scientific or philosophical person has to have a mind that is flexible and able to access hard to reach places, and yet also capable of reintegrating itself so as to avoid becoming an amorphous blob. Q: How did you select the superheroes to include in the book, and do you have a favorite among them? A: My original plans were exceedingly ambitious—I was going to compare dozens and dozens of superheroes, popular and obscure alike. That quickly proved unmanageable. A decision was made to focus on characters who are most well-known to the general public, then pit them against each other in pairs. I had to find something distinctive about each, as regards which ethical theme they represented, and yet also match them up so that there was something shared within each pair I compared. I settled on characters featured in major motion pictures within recent years at the time I mapped out the book’s structure. I didn’t want to write exclusively for comic book collectors. I didn’t want to get bogged down in exposition, and I wanted to avoid too much inside baseball. Luckily, and not surprisingly, the best-known characters are also the most archetypal, making them suitable subjects for the analyses I conduct. A book about my favorite characters would have featured Captain Marvel. Her movie is coming out in 2019. She’ll sell a lot of Halloween costumes next year, I expect. Among the characters I appraise at length, Green Lantern is probably my personal favorite. I’m almost afraid to admit that I’ve read every comic book with the words “Green Lantern” on the cover, apart from some issues from the late 1940s. I love the lore. As is only fair, though, I’m pretty rough on GL in Superhero Ethics. He’s one of the characters I criticize most harshly. A: I plan to write more on the philosophy of Thomas Hobbes—I’m preparing something on his treatment of magic presently. As regards something else with a pop culture dimension to it, that’s still to be determined! A: I’ll be on a panel at Montreal Comiccon in July if anyone would like to argue with me over the merits of one superhero or another. Comic book readers love to tell you why your opinions are wrong; it’s practically our Olympic sport.